The local dirt-riding community has some exciting new terrain to rip up. Completed just last spring, Mountain of the Rogue Trail features Southern Oregon’s first and only purpose-built mountain biking trails. Located near the I-5 corridor and less than two miles from downtown Rogue River, the trail system can be accessed from a parking area on N. River Road. Mountain of the Rogue is a system of flow trails that were designed to give riders a thrilling and intuitive downhill experience. The smooth, predictable singletrack incorporates man-made features such as berms, rollers and cambered turns, allowing riders to maximize momentum while maintaining control. The three downhill loops are all reached from Rat Pack Trail, a roughly three mile long climb that begins at the parking area and winds up the south and west-facing aspects of a long ridge. A left at the first intersection will lead you down Pay Dirt, a fun little loop rated for beginners. Intermediate to advanced riders looking for steeper, more technical terrain can continue climbing north along the ridge to reach the loops known as Breakdown and Armbar. From there, riders begin an adrenaline-pumping descent of 1,300 vertical feet. In order to get a rider’s perspective on the new trail system, we caught up with Emily and Dusty Caseria, two competitive mountain bikers who were able to check out Mountain of the Rogue last November. Although the couple has more of a cross-country background, they admitted to having a lot of fun on the downhill sections. She mentioned running into a few Ashland riders on the trail who had volunteered during the building process. As it turns out, none of this would have been possible without the overwhelming support of local biking communities—groups like the Rogue River Area Trail Stewards (Rogue RATS), who approached the Bureau of Land Management with a formal proposal to develop the trails on public land. Although it will depend largely on funding and local interests, there are already hopes to expand upon the first phase of the trail system. The BLM’s project summary mentions “possible future phases” such as: constructing additional trails starting at the trailhead, expanding the current trail system to connect with area roads and installing restroom facilities at the parking area. 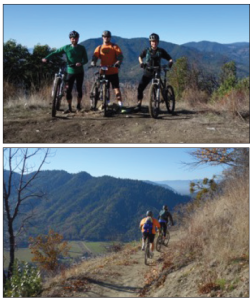 While plans to expand the trail system are still up in the air, one thing is for sure: if you’re looking for a rush on two wheels, check out Mountain of the Rogue Trail right outside of Rogue River. Just remember to wear a helmet, be easy on the front brake and go with the flow.